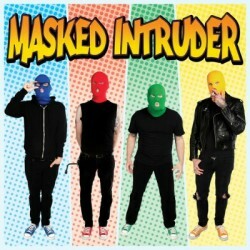 It’s probably impossible not to smile at Masked Intruder’s self-titled debut. Hidden behind a veil of anonymity, the foursome have converged through a myriad of cell bars and prison yards to construct some of the catchiest, colour-coded pop-punk tunes ever written. Between being as violent and delusional as it is hilarious and heartwarming, Masked Intruder successfully pairs the impeccable harmonies of the Beach Boys with the reckless endangerment of the Dopamines. From start to finish, Masked Intruder bounces along at a delightful pace, ducking in and out of tale after tale of broken hearts, insane courtships, and overall loneliness in a world intent in flaunting its romantic conquests. At the risk of sounding stale, Masked Intruder don’t vary much in their delivery, but never fail to actually show up to the plate. Beginning with a series of handclaps and letter chants, the title-track quickly jumps into “25 to Life” with a woop-woop of police sirens and pummeling riffs to back-up Blue’s gentle croon. It only continues with a tightened, polished version of “How Do I Get To You?” from the band’s demo (the first of two redone tracks from the demo – the second being “Unrequited Love”). Masked Intruder’s debut is about as terrible as it is serious. Tongue-in-cheek refrains, the odd solo, and retro back-up vocals collide in a package of 13 songs bursting with energy and a healthy dash of hilarity. It’s an album as indebted to hopeless romantic pursuits and crushing rejection as it is to the evolution of contemporary pop over the past 60 years. Also, it’s very comfortable being spun on repeat. 8.5 / 10 — Nick M.
Posted Nov. 12, 2012, 4:58 p.m.
Posted March 1, 2015, 3:52 p.m.
Posted April 20, 2016, 6:35 p.m.
Posted May 1, 2015, 12:42 p.m.
Posted April 6, 2015, 8:22 p.m.